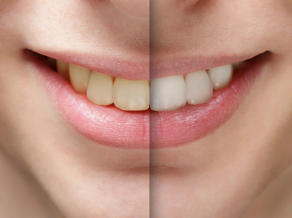 We at Rock Point Family Dentistry provides a safe Teeth Whitening services to our patients. Having the teeth professionally whitened at the dental office decreases the risk of the harmful over-the-counter whitening kits. Unlike the other teeth whitening products that everyone can buy in a local store, teeth whitening procedure at Rock Point Family Dentistry is effective and worth it. We make sure that patients will be fully satisfied with our dental service, giving them the most out of their teeth whitening investment! Positive First-Impression. They say that “first impression lasts.” Well, the first thing that people will notice when seeing others smile is their teeth, of course. It only takes a few seconds for the brain to form a first impression. Showing that beautiful smile to a stranger means instilling a positive feeling. Improved Self-esteem. A healthy smile means healthy self-esteem. The looks have an impact on oneself. The better someone feels about their looks, the better they will think about themselves too. Improved Aesthetics. Knew someone who is afraid to show their smile on pictures? Having the whitest teeth will boost one’s confidence, even with the camera on! Youthful Appearance. Stained, discolored teeth are aging teeth. Some people opt for other painful and expensive cosmetic face surgeries without them knowing that teeth whitening can make the appearance look younger. Improved mood. Having a bright, radiant tooth can make the person smile often. The act of putting the mouth in a shape of smile will affects the blood flow to the brain causing the person who smile feels happier. Give your smile a boost! Book an appointment with Rock Point Family Dentistry and check out our services under Teeth Whitening in Cedar Park, TX. We are located at 115 S Lakeline Blvd #200, Cedar Park, TX 78613.